Prepare yourself for an unforgettable journey aboard the luxury sailing catamaran MUSE. MUSE is a spacious Sunreef 70 that features three doubles, two twins, one single and a Pullman, making it an ideal option for charter families with children. The yacht is very informal, not showy or ostentatious, guests can relax without worry that their young ones will endanger artwork and décor. The Owner successfully created an overall design theme to reflect the charming ambiance of a house in the south of France. MUSE features interiors in contrasting tones of Finnish birch and exotic wenge woods complemented by creamy, plush upholstery and custom accent pillows. The salon has a large plasma TV, DVD's, and a Wii station that provides limitless entertainment options for guests of all ages. Guests gravitate to luxury yacht MUSE’s spacious deck and massive full-beam flybridge to lounge in sun or shade and enjoy sea breezes and magnificent views. On the aft deck to port and starboard luxurious lounge pads beckon relaxation. At the spacious aft deck table guests can gather together to enjoy cocktails and dining al fresco. For the actively minded, MUSE has plenty of watersports options including a semi-rigid tender with 75 HP motor, sailing dinghy, kayaks, adult and child water skis, a wakeboard, and snorkeling gear. This highly regarded Sunreef 70 exceeds expectations of even the most experienced yachtsmen for stability and seaworthiness. 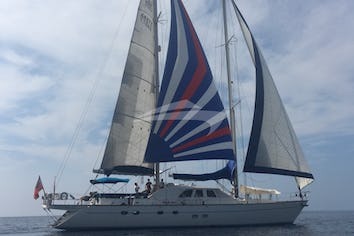 Guests may experience her delightful ambiance and sea keeping ability on a charter in the Western Mediterranean during the summer or the Caribbean during the winter. 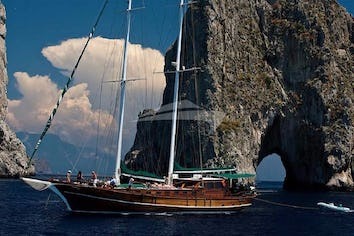 MUSE can accommodate 12 guests in 6 cabins. A Guest cabin has a double bed, a pullman, shower and toilet. Vincent, known for is strong adventurous string and is solid sailing background has been cruising the world Oceans for the past 12 years. Vincent is originally from Canada but as pursuit is captain education in New Zealand where he also did some offshore races to the south pacific islands. His travel in search of the perfect tropical destination and is passion for Kite Surfing has brought him to the four corners of heart where he has sailed in command on Catamaran and Yacht. 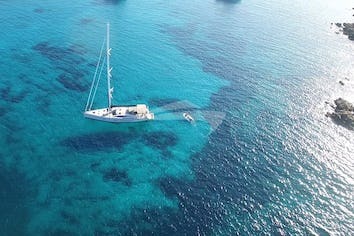 After many years cruising the Caribbean Sea Vincent as recently return to the Mediterranean. Of a natural peace and forbearing, Vincent will guide you in complete safety. He will make you discover idyllic and unforgettable places during your cruise aboard Muse. - Spoken languages: French and English. Born and bred in Quebec City, Olivier discovered cooking at 18 during a trip in the Canadian West Rockies. After learning his craft for several years, he decides to link his passion for cooking with his love of travels by leaving on an around-the-world trip. For 3 years, he will discover new cultures, gastronomy and ways of living. Coming back from this wonderfully rich experience, he works for several years in the Mountains for Relais-Château as well as in Quatar, before deciding to make true his other dream: working as chef on a sailing yacht. His modern cuisine takes influence in his travels, for a savoury melange. Born in Montreal Québec (Canada), Marie-Helene has a very big work experience in the hotel business top of the range. More than 6 years spent in the hotel W, the luxurious hotel being part of the chain Starwood where she occupied several positions. Additionally, working as a bartender for several years, Marie-Helene animated several evenings aboard a cruise ship sailing on the St. Lawrence River. His passion for traveling and discovering distant horizons led her to several countries of Europe, to the United States and to Mexico. Dynamic, smiling and sportive, she will know how to share her energy with her guests. Marie-Helene is a friendly and discreet hostess. She will attend to the smallest details of your comfort on board to make you appreciate exceptional moments. - Spoken languages: English and French.